What in the world? Yes, these are baby eggplants I patiently piled up on top of a box of potatoes. 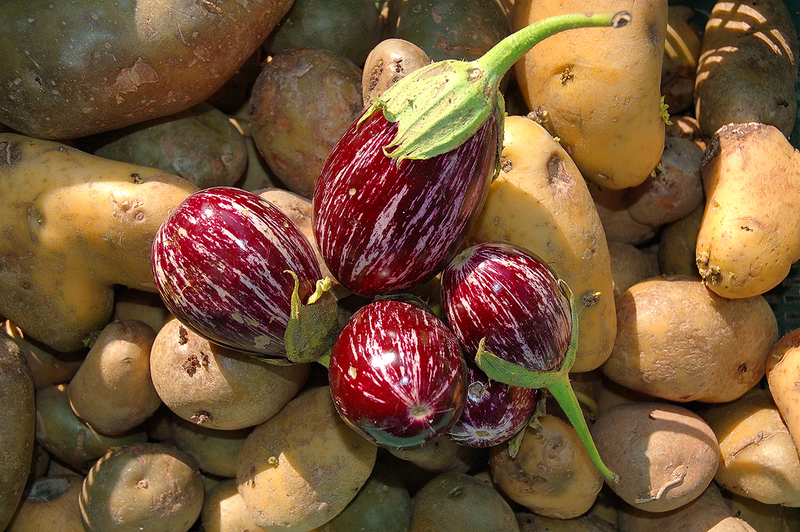 In fact I just liked the brilliant color of the aubergines but I thought potatoes would help highlight the purple reddish plant. From the food point of view, now that I introduce these vegetables, let's say that there are recipes that include both ingredients. With this link to Indian Vegetarian Recipes and especially the Eggplant and Potato Curry (Vagan Bateta nu Shak) I am sure the post really acquires a real meaning no matter how surrealistic I may sound. I'm in the middle of a mystic trance lately, it must be the winter! My mom was Italian and used eggplants a lot. My husband is not too wild about it, unfortunately! Nice photo, Carlos. Wonderful quality photograph. So much detail.